--Mrs. Moxley is interviewed by Detective Keegan until 3:00 pm. Documentation is not yet available. 2:00 pm --According to Rush Jr., he picks up his cousin Geo Skakel at the airport at roughly this time. Documentation is not yet available. 2:30 pm --According to Julie, she arrives home at approximately this time. 3:00 pm --FROM FOLIO 9 , Detectives Carroll and McGlynn interview Ed Hammond. He cooperates fully, is advised of his rights, and is brought to the station house with blood stained trousers around this time. --FROM FOLIO 11 , Detectives Brosko and Lunney arrive at Skakel house and interview Julie and Michael Skakel around this time. 3:30 pm -- According to John Pinto, he arrives at the Skakel residence around this time. Documentation is not yet available. 4:00 pm --According to Geo Skakel and John Pinto, they drove off to a Georgetown reunion weekend in the Revcon vehicle at around this time. Documentation is not yet available. --FROM FOLIO 13 , Ken Littleton is interviewed for the first time. "He never went out that night after dinner ... he saw nothing suspicious." 4:30 pm --According to Rush Jr., he left for Dartmouth at about this time. Documentation is not yet available. 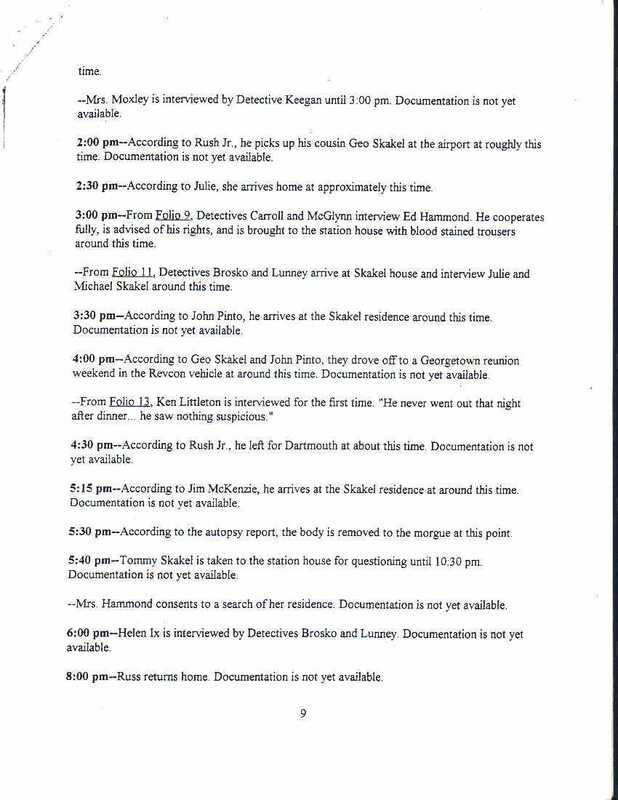 5:15 pm --According to Jim McKenzie, he arrives at the Skakel residence at around this time. Documentation is not yet available. 5:30 pm --According to the autopsy report, the body is removed to the morgue at this point. 5:40 pm .--Tommy Skakel is taken to the station house for questioning until 10:30 p.m. Documentation is not yet available. --Mrs. Hammond consents to a search of her residence. Documentation is not yet available..
6:00 pm --Helen Ix is interviewed by Detectives Brosko and Lunney. Documentation is not yet available. 8:00 pm --Russ (sic) [Rush] returns home. Documentation is not yet available.